Scientists at Caltech have induced natural sensations in the arm of a paralysed man by stimulating the brain with an array of electrodes. The patient has a high-level spinal cord lesion and cannot move his limbs or feel them. The work at Caltech could one day allow paralysed people using prosthetic limbs to feel physical feedback from sensors placed on these devices. The research was done in the laboratory of Richard Andersen, James G. Boswell Professor of Neuroscience, T&C Chen Brain-Machine Interface Center Leadership Chair, and director of the T&C Chen Brain-Machine Interface Center. A paper describing the work appears in eLife. 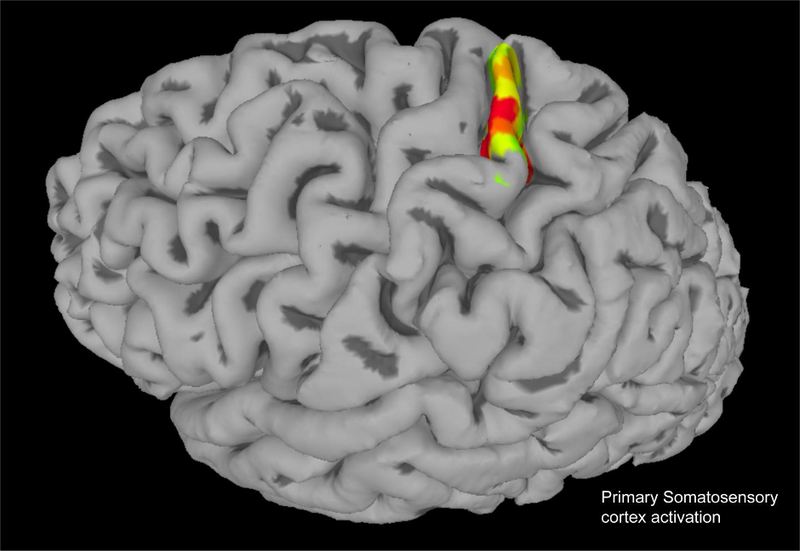 The somatosensory cortex is the part of the brain that governs proprioceptive sensations, which are sensations of movement or the body’s position in space; and cutaneous sensations, such as feeling pressure, vibration, and touch. According to the paper, spinal cord injuries disrupt these messages. Even though the somatosensory cortex has not been damaged, sensation is lost for the affected body areas. As no treatment exists to repair the spinal cord the loss of sensation is permanent. Previous to the new work from Caltech, neural implants targeting similar brain areas predominantly produced tingling or buzzing sensations in the hand. The Andersen lab implant is able to produce much more natural sensation via intracortical stimulation, similar to the sensations felt by the patient prior to his injury. Two arrays of tiny electrodes were surgically inserted into the patient’s somatosensory cortex. Using the arrays, the researchers stimulated neurons in the region with very small pulses of electricity. According to Caltech, the participant reported feeling different natural sensations – such as squeezing, tapping, a sense of upward motion, and several others – that would vary in type, intensity, and location depending on the frequency, amplitude, and location of stimulation from the arrays. Caltch further claims that this is the first time such natural sensations have been induced by intracortical neural stimulation. Though different types of stimulation induced varying sensations, the neural codes governing specific physical sensations are still unclear. In future work, the researchers hope to determine the precise ways to place the electrodes and stimulate somatosensory brain areas in order to induce specific feelings and create a kind of dictionary of stimulations and their corresponding sensations. The next major step, according to Andersen, is to integrate the technology with existing neural prosthetics.